There are three ferry companies which provide passenger services from Koh Tao, some use fast ferries and others use slower boats. Lomprayah High Speed Ferry Company ( 1 hour 50 minutes). Booking these services in advance is a good idea in high season and around the time of Koh Phangan’s Full Moon Party when demand for tickets can be high and some departures sell out several days in advance. The Songserm Company has a departure every day from Mae Haad pier departing at 10.00 and arriving at 13.15, a journey time of 3 hours and 15 minutes. The cost is 500 THB per person. Tickets for fast boat services can be purchased online in advance using the Search Box below. The price of the tickets is the same as buying the tickets at the pier. The slower of our two recommended services. This service is very useful if you have an early flight from Koh Samui airport as the first boat from Koh Tao arrives at 09.00. 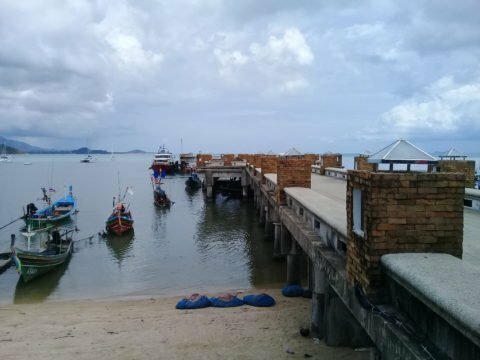 The arrival point for the Seatran Discovery service is Bangrak Pier which is only 5 minutes drive from Koh Samui airport. The Lomprayah Company operates the quickest ferry from Koh Tao to Koh Samui. Lomprayah ferries have large sun decks on the top deck of the ferry from which passengers can get excellent views of the Ang Thong marine park on route. Inside the cabin there is a small shopping selling drinks, snacks and sandwiches. The two fast boat services from Koh Tao to Koh Samui each arrive at different piers. This service arrives in Koh Samui at Maenam pier. Maenam pier is 750 metres (9 minute walk) from the main ring road around the island where you can easily flag down a shared pick up truck taxi which will charge around 60 THB per person for the trip to Chaweng. If 750 metres is too far to walk then speak to the Lomprayah check in staff about arranging a place in one of their minivans. It costs 150 THB per person to any point on the island from Maenam pier. This service takes you to the Seatran pier in Bangrak. Bangrak is near the northern most point of Koh Samui and very close to the airport. From here you can pick up a songthaew on the main road to Chaweng. For other destinations in Koh Samui we recommend that you pre-book a place in a minivan service organised by the Seatran Discovery by speaking to the staff when you check in to start your journey from Koh Tao to Koh Samui. The charge is 150 THB per person to anywhere on the island.